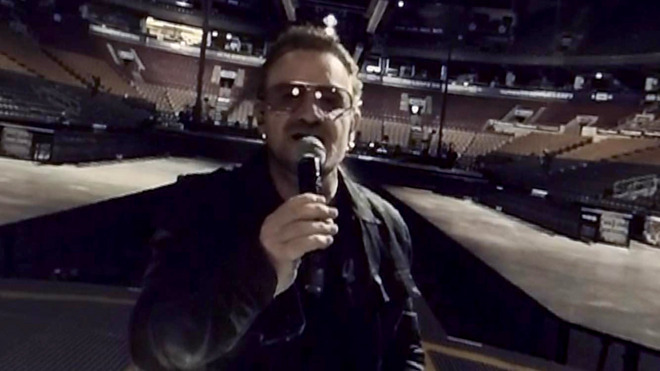 For the general public the video is available through Vrse, a multi-platform VR app (including iOS), and mixes scenes of U2 playing onstage with other musicians playing in their homes. People who don't have a headset can simply watch the video in fullscreen mode and tilt or rotate their device to change perspective. In recent days Apple has been showing the video to U2 fans on "The Experience Bus," a vehicle following the band on tour, according to TechCrunch. There the setup is more advanced, with Macs projecting the video into Oculus headsets, and Beats headphones supplying audio. iPads on the bus are believed to be used for promoting Apple Music. The video itself displays Apple Music branding at the beginning, though it's unclear to what extent Apple was involved in producing the content. The company has had a hand in music videos for artists like Drake and Pharrell Williams. Apple has periodically dabbled in VR technology, for instance devising the QuickTime VR file format in 1994. Over the years the company has occasionally filed for VR-related patents, but never released any tangible products. In fact the company appears poised to venture into augmented reality instead, which like Microsoft's HoloLens displays 3D graphics over real-world scenery. Earlier this year the company bought a company specializing in AR called Metaio.